Rick and Debbie serve at Mbingo Baptist Hospital, Mbingo, Cameroon at the invitation of the Cameroon Baptist Convention Health Board. The Bardins serve there in support of the Christian Internal Medicine Specialization program. Rick is board certified in Internal Medicine and Pathology and will be teaching in the Christian Internal Medicine Specialization program (CIMS) and also in establishing a pathology service in addition to helping support the PAACS (Pan African American College of Surgeons) surgical program there. Debbie will serve as Staff Nurse in the OB/GYN clinic there. 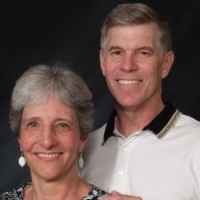 The Bardins have 11 years experience as former missionaries at the Baptist Medical Center-Eku, in Eku, Nigeria under the International Mission Board, SBC. Rick was Chief of Internal Medicine while Debbie worked in rural health clinics and taught pastor’s wives at the Bible College. "Debbie and I have both become convinced that Mbingo is where God is leading us to minister now." "There is a need both for Internal Medicine faculty to support the I.M. residency (known as the Christian Internal Medicine Specialization program, CIMS) and for a Pathology service to be established to support CIMS and the surgical residency program, PAACS (Pan African American College of Surgeons)." "By God’s grace I hope to fulfill this role. Even more importantly, it is my desire to be an instrument of Christ to encourage doctors who are going through CIMS to walk closely with Him and therefore be His hands and voice in ministering to their patients for His glory." "We both sensed that this was where God was leading us and are excited about this new part of our adventure together serving our Lord."